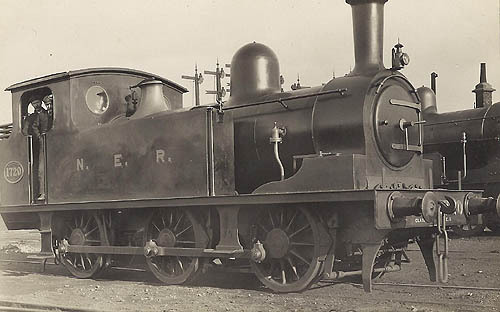 The North Eastern Railway (NER) Class E1 (LNER J72) locomotives were Wilson Worsdell's continuation of his brother's (T.W.Worsdell) successful Class E (LNER J71) standard shunting locomotive. W. Worsdell disliked his brother's preference for Joy valve gear and compound expansion. The J71s had neither of these design features, so the new J72s were very similar in design. W. Worsdell increased the cylinder diameter to 17in and stroke to 24in (from 16in x 22in). The wheel diameter was decreased slightly, in line with his preference of smaller wheels for goods and shunting locomotives. These changes actually represented a return to earlier North Eastern Railway (NER) practice under Fletcher. A total of 113 J72s were built in nine batches from 1898 and 1951. This large separation in time (53 years) between the construction of the first and last J72s, is probably a record for a British steam locomotive class. The J72s proved very successful and would eventually be found throughout the LNER system. They were the only class that was allocated to all of the LNER's major constituent companies. As well as the wheel size, the spacing was changed slightly from 6ft 6in + 7ft 2in on the J71 to 6ft 8in + 7ft 0in on the J72. The frame was also lengthened by 1in. The first two batches of ten locomotives each were built in 1898 and 1899. There was then a pause until a batch of twenty were built in 1914 under the tenure of Raven. These locomotives were modified slightly to have heavier frames and longer bunkers with coal rails. Ross pop safety valves were fitted instead of the Ramsbottom valves which were fitted to the first two batches. Some of these changes such as the safety valves, fittings, and coal rails were retro-fitted to the first two batches. A further batch of ten were built in 1920, primarily to keep the Darlington Works employed during the post-war shortages whilst they waited for materials to build larger locomotives. Twenty five were also ordered from Armstrong Whitworth & Co at about this time, but they were not delivered until summer 1922. The LNER completed this building period with ten more J72s which they built at Doncaster in 1925. J72s were included in both the 1930 and 1931 build programmes, but these were cancelled due to the Depression and the success of the new Sentinel Y1 0-4-0T engines. Thompson's standardisation plans included an unspecified light shunting locomotive, but listed the J72 for long term withdrawal. A new locomotive had not been added to the standardisation plan by 1946 when Peppercorn became the new CME. He listed the J72 as the new standard light shunting locomotive, and an order was added to the 1946 build programme. This was delayed until after Nationalisation (1948) when fifteen were built at Darlington in 1949. These were followed by five in 1950 and eight in 1951. By this point, the new diesel shunting locomotives were being introduced in force, and no further steam shunters were built. The J72 shared the same boiler design as the J71. Although they were interchangeable, this did not become common until after Grouping (1923). 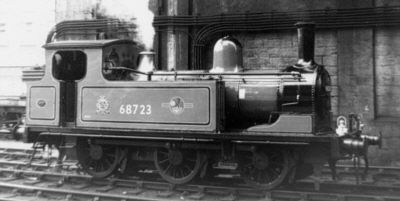 The original two batches of J72s were originally built with Ramsbottom safety valves which were modified to have Ross pop valves after the 1914 batch was built. The boilers for these twenty engines remained with the engines and they were never used on other locomotives. As with the J71s, the Ross pop valves tended to obscure the cab view when they released steam. Unofficial pieces of piping were initially fitted, and eventually a cover resembling that used on the Ramsbottom valves became an official modification. A Nu-Way mechanical stoker was fitted to No. 2331 in May 1939 by Robert Stephenson & Hawthorns. This carried coal from the bottom of the bunker to the firebox using two revolving spirals. Two fans blew the coal from the end of the spirals into the firebox. The fans and spirals were driven by a small steam turbine. The engine re-entered service in July 1939. A thermo pump to automatically control the boiler feed water was fitted two months later. These alterations were intended to allow the locomotive to be operated by one person, and they appear to have been a success. However, the combination of World War 2 and union intervention led to no further locomotive conversions. By all accounts, No. 2331 continued to use this gear until it was removed at Darlington in 1947. Although the J72s were eventually found throughout the LNER system, transfers were surprisingly infrequent. Long allocations were common, and at least one locomotive remained at the same shed for its entire life (No. 1746 at York). The first twenty locomotives were allocated to Hull (6), West Hartlepool (4), Borough Gardens (3), York (2), Heaton (2), Darlington (1), Tyne Dock (1), and Stockton (1). J72s were tried in Scotland in 1924, but this did not become permanent until 1932-4 when six moved north to replace the Great North of Scotland (GNSR) J90 and J91 0-6-0Ts. These were allocated to Keith (2) and Kittybrewster (4). During the late 1930s, a number of transfers were initiated by the closure of the Ferryhill and East Hartlepool sheds. At about this time, attempts were made to reduce the number of different classes allocated to individual sheds. J72s also began to slowly replace the J71s from carriage shunting duties during this period. Changing traffic conditions during World War 2 led to a wide variety of transfers of other locomotive classes, but the J72s remained relative unchanged. After the delivery of the last J72s in 1951, the allocations was: Alexandra Dock (14), York (11), Middlesbrough 10), West Hartlepool (10), Gateshead (9), Borough Gardens (7), Heaton (7), Darlington (6), Kittybrewster (6), Sunderland (5), Blaydon (4), Tyne Dock (4), West Auckland (3), Dairycoates (3), Bidston (3), Neville Hill (2), Eastfield (2), Doncaster (2), Ipswich (2), Hexham (1), Scarborough (1), and Wrexham (1). The withdrawal of J71 and J77 locomotives and the increasing use of 350hp diesel shunters during the 1950s, led to an increased number of transfers during the mid to late 1950s. The older locomotives survived well, and the class remained intact until 1958. Withdrawals were rapid, with large reductions in the class size in 1960 and 1961. The last J72 was withdrawn from regular service in 1964, although two (Nos. 69005 & 69023) were transferred to service stock. Renumbered as Departmental 58 & 59, these locomotives were used to de-freeze coal wagons on the Blyth shipping staithes. After one year at Blyth, they were moved to Gateshead where No. 58 was unsuccessfully used to clean the bogies of diesel locomotives. They were also used to de-ice points in Tyne Yard. After a long period in store, No. 59 was sold in September 1966 and has been preserved. No. 58 was withdrawn in October 1967 and was scrapped in January 1968. Heating Surface: Total: 731 sq.ft. None of the NER or LNER J72s survive into preservation, although one of the BR-built locomotives does. No. 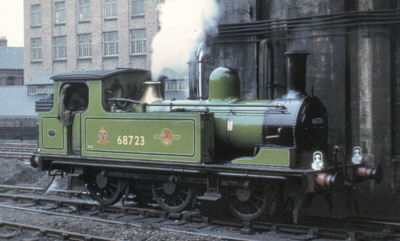 69023 (Departmental No. 59) was purchased by Mr. R. Ainsworth who named it Joem in honour of his parents. Joem is currently owned by the North Eastern Locomotive Preservation Group (NELPG) and is kept at the North Yorkshire Moors Railway. Joem's small size makes it easy to transport and has proved itself as a popular visitor to other railways. Joem's boiler certificate expired in 1996, but is it currently being overhauled and is expected back in service in about 2007-8. 3SMR produce a 3mm scale white metal kit of the J72. Bachmann sell a ready-to-run model of the J72 for OO gauge. 4mm scale kits of the J72 are produced by Nu-Cast and Perseverance. DJH's Piercy Range includes an O gauge kit of the J72. Thank you to the P.H. Groom collection for permission to use the above photograph of BR No. 69020 at Darlington. Thank you to Alan Willis for the black & white photograph of Newcastle pilot No. 68723. Thank you to the Mike Morant Collection for the colour photograph of No. 68723. Thank you to Robert Langham for the photograph of NER No. 1678.